(SPOT.ph) Convincing some people to eat their vegetables may require Jedi-like persuasion and facts backed by volumes of scientific research. Making an adult eat food that is perceived to be preservatives-free and organic can cost you an arm, a leg, a strong statement, and mental toughness that should be able to withstand their conviction. Kids are more heartless. They’ll push their food off the table unless you magically turn their utensils into robots or vehicles. For example, not everyone likes monggo. You probably don’t like it yourself. Here are some dishes you can try even when you don’t want to. JUST. TRY. Who can resist crispy fried liempo? Even those who are on a ‘strict diet’ will turn their gym day to unscheduled cheat day for those crispy fried pieces of heaven. Now, mix that with guisadong monggo. Does that sound tempting enough? You’re about to break and you know it. On to Dish #2. Mix a well-loved food with two of the most hated vegetables in the world. Ham is not just for wine night and special occasions. Dare yourself to eat spinach with that. 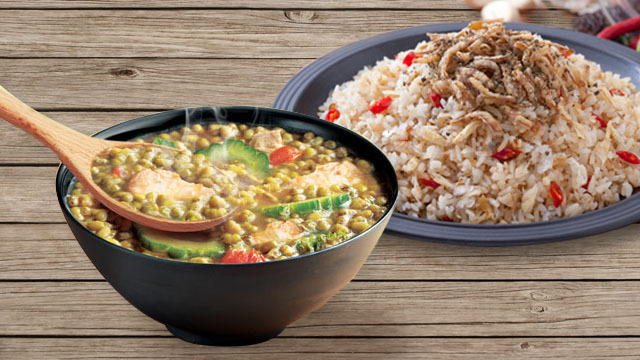 Double dare yourself to throw monggo guisado into the mix. Promise, it’s worth a shot! This might be the hardest one to swallow. Are you ready to say, “I can’t eat this”? Your fondness for gata may equate to zero and monggo to a negative number, but as weird as it may sound, it’s actually a good combination. Just psych yourself up that you can do it. You can do it! Say, “Aaahh”. Imagine it’s a rainy day. Work is suspended, you’re stuck at home with nowhere to go, and very little ingredients to work with. Try cooking creamy munggo and tuyo rice. For one, you’re going to cook it with butter and quick melt cheese. Do you know anyone who hates those? You just mix everything together and you can start ditching champorado for this hearty dish. Lastly, you can always go the classic route. For years, your mom has always had a hard time convincing you to pork monggo. Now that you're older, it's about time you make up for all the times you chose junkfood over her cooking. The best way to go about this timeless recipe is preparing it with Knorr pork cubes. Made with real meat, Knorr pork cubes will bring out that much-needed pork flavor that's reminiscent of your good ol' days at home. This article was created by Summit Storylabs in partnership with Knorr.